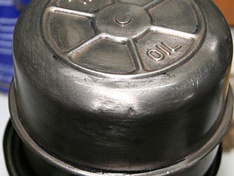 The oil breather cap was full of sludge. I guess it didn't saw much cleaning in the past. 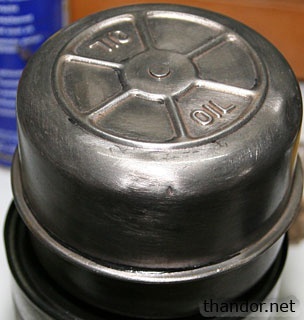 Cleaning the cap is a job done quick- just pour in gasoline and shake the breather cap. Do it a couple of times and then clean it up using water. On the picture I sanded it as well and got to the second layer of RX5; ready for painting!